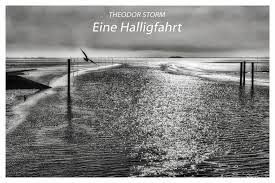 Theodor Storm’s Eine Halligfahrt (Journey to a Hallig) is a novella (possibly just a longish short story) describing a pleasant, short journey across the sea from the North Friesland region of Germany to one of its many ‘Halligs’, small islands unprotected by dykes and hence at the mercy of the sea. A party of three – the narrator, a young lady and the young lady’s mother – are ferried across the water to meet a relative who long ago decided to spent the rest of his days away from the mainland. This is just the start of the theme of looking back (if not in anger), and while the main action takes place at a later time than that of the energetic squirrels, the whole story occurs in the distant past. Eine Halligfahrt is a short tale, but there’s a whole lot going on. In addition to the slow, unsuccessful flirting between the narrator and the beautiful Susanne, we are treated to a personal tour of the hallig (with Storm as our own travel guide). On the trip to the little island, there’s even a glimpse of local mythology, as a sailor tells the story of Rungholt, a mysterious North-Sea Atlantis. Storm treads a very fine line between poignancy and the over-wrought emotion of the Sturm and Drang works (e.g. Young Werther…), but he usually pulls it off. This is one of his better descriptive pieces, full of beautiful, moving passages. I do love this one, enough to visit the area, although not enough to visit the actual hallig, which would have been a pain. But maybe some day. It still has only the one house – it still has the little pond. The Denis Jackson translations are amazing, or what I really mean is the apparatus – the maps, the notes, the history. The Angle Classics editions are ideal. The story is a deep little thing. I hope you have encouraged others to seek it out. Thanks for this discovery! Storm is together with Fontane and Raabe one of the most important and best prose writers in Germany in the second half of the 19th century. I like especially his Schimmelreiter (The Rider on the White Horse), Pole Poppenspäler and Immensee. Fontane is still kind of popular and also Storm is still read, but Raabe seems to have been almost completely fallen into oblivion. I think Storm is an author I'll have to try, especially after your recommendation. I'm interested in short, slow descriptive works at the moment – as my reading slows down I feel I can appreciate such authors now. I greatly enjoyed your review of “Journey to a Hallig.” I have lived in Heidelberg for more than two years now and, shortly after I arrived, I was introduced to Theodor Storm. He is a writer of the type such that, once I begin reading his lyrical, and often very strange, “novellas,” I can’t put them down. For me, he is one of those short story writers, e.g., Borges and Hawthorne, that are simply compelling. I just read this beautiful little story about the North Sea Hallig visited by the story’s main character and his two companions just a few days after spending some time in Husum, Germany (Storm’s home town) and on the North Sea coasts of Germany and Denmark. Thank you for remembering a now almost forgotten writer who should be better remembered and appreciated. If ever in Husum, one should visit Storm’s former home there, which has been transformed into an incredible museum dedicated to the author and his work. The Hallig Süderoog is described in the novella „Eine Halligfahrt“.